Years of dreaming, planning and hard work will soon become a reality for the College of Human Sciences. On Oct. 4, representatives from the college and OSU leadership will break ground on a new wing on the north side of the Human Sciences building. The expansion will include a multipurpose hall, a public-private partners suite, classrooms, lab space and more. The expansion will also provide a main entrance for the landmark building that will act as a bookend to the new Heritage Walk, a major pedestrian thoroughfare on the Stillwater campus. On April 4, Dean Stephan Wilson announced plans for the addition to the college's 63-year-old building. "As we are moving rapidly through the 21st century, we must continue building upon our heritage of donor investments to create the next generation of state-of-the-art laboratories and spaces to push the boundaries of discovery of today into the world of tomorrow," Wilson says. "A variety of technology-enriched laboratories will be introduced with the new space," he says. These include virtual and augmented reality labs to provide realistic experiences for retail merchandising and interior design; industry-standard hospitality labs; and interactive spaces that will allow students to practice calmly and professionally solving problems with "virtual customers, virtual parents and virtual counseling." "Frankly, the list of possibilities for this new, vital space is limited only by the imagination," Wilson says. "Now is the time for the College of Human Sciences to build the future." The college moved into its current building in 1951 with room for 600 students and 40 faculty members. It was lauded for its innovative labs and learning spaces. Today, nearly 2,000 students are enrolled in the college's various degree programs, which are led by more than 100 faculty members. "Facilities in and of themselves don't transform things; people transform things. But people need facilities to accomplish what they do," says OSU President Burns Hargis. "Our students need those facilities; our faculty and staff need those facilities. They have to have equipment and stay current and state of the art. That's what is going to happen here. It's not just the new part of the building, either. The new wing will provide additional space for other areas to grow." Artist's rendering of the Great Hall. 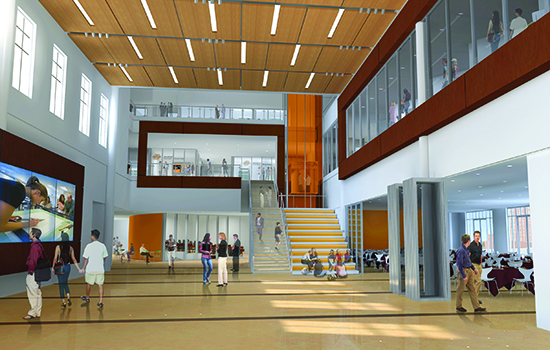 The new 76,706-square-foot space will enhance engagement, improve experiential learning opportunities and increase the college's presence on campus to better serve the community and reflect its significance at OSU, says Jeff Fenimore, principal with DLR Group, the architectural firm working on the expansion. Designs include extensive glass windows to provide portals into working labs, increasing the transparency within the college, which has diversified fields of study within hospitality, design, merchandising, nutrition and human development. Second-year master's student Lauren Oseland has been part of the planning process since she hosted town-hall meetings to gather students' input on the building while she was an undergraduate in human development and family science. "Watching the building come to fruition is a thrill to me," she says. "The designs you see today are an integration of ideas proposed by students within our college. It truly is a building by the students, for the students." To date $17.5 million has been committed for the $25 million project. DreamMaker and DreamBuilder donors, whose early gifts and commitments have led the way, attended the April announcement and are expected to participate in the October groundbreaking. Micki Jeffery, 1970 Human Sciences graduate, was one of the first donors to contribute to the building fund in 2008. "I was invited to an Associate's meeting, and they told us about the project," she says. "I just got fired up. I attended classes in the building in the late '60s and early '70s, and the building was OK, but it was very old. … So I made my first donation." Jeffery, who has been a teacher, a home economist for Kansas City Power and Light, a dietitian and a child psychologist, says she knows well that the college provides students with the education they need to succeed in the workforce. "It's not cooking and sewing anymore," Jeffery says of the college. "I love all the people involved in the building project, and I like working for a cause. It makes me feel a part of OSU." Wilson says early investors such as Jeffery are leading by example. "We are ready for others to follow this dream," he says, mentioning that the Human Sciences Partners Group recently pooled their resources to make a major pledge for the building. He's hopeful others will follow. "Maybe they will team together from an era, a major, a location, a life experience. We hope they will think about their own individual gift as well as gifts that could bring communities together. We are excited to see this dream become a reality."